The fire company’s area continued to grow rapidly and in 1972 it was decided that there was a need to build a larger more modern facility and to get the station off of Route 70 due to increased traffic and congestion. A large piece of ground was purchased near the present fire station but had frontage on the side road making for easier access for members and apparatus response. The new Deer Park Fire Station was built at 1100 arlkress Road and was dedicated in June of 1973. Among the many features were four drive through bays, a six story training tower and hose tower, and a bunk room facility. An elaborate training center and smoke house were added several years later. The fire company hired its first and only career Fire Chief, Wil C. Ward on January 1, 1974. He served as the Chief until December 31, 1994. The seven fire districts were merged into one Fire Department on January 1,1994. The Cherry Hill Fire istrict #13 was now a single fire department. The Cropwell Station continued on until 1996 but the loss of volunteer fire fighters available to respond to maintain required staffing levels finally became quite evident and the station went inactive during that year. An idea was introduced by one of our members and a committee was formed to do a feasibility study. 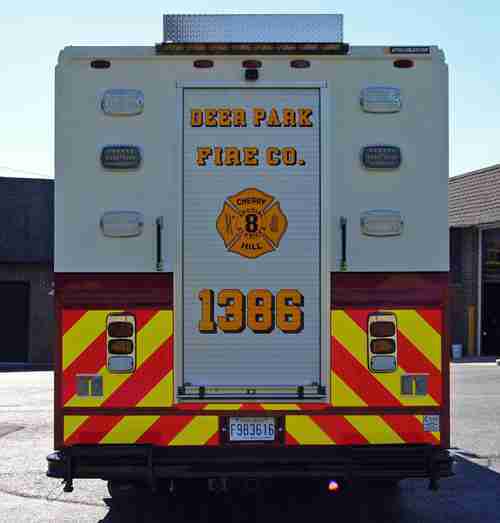 Many hours were spent in research and site visits and it became apparent that the Deer Park Fire Company could remain a viable part of the Cherry Hill Fire Department and continue to serve the community. In November 2002 a plan was drawn up and a budget was prepared for presentation to the Fire Chief and Fire District Board of Fire Commissioners to operate a "Special Services Unit." 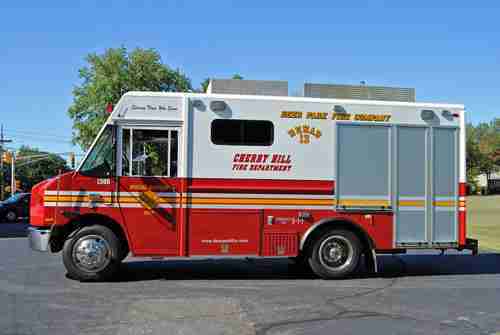 This unit would respond to all major fires and emergency incidents within Cherry Hill and surrounding communities as needed. It would provide basic re-hydration and foods to fire and emergency personnel working at these incidents. The plan was accepted and approved by the members of the Deer Park Fire Company and Cherry Hill Fire District. Two new pieces of apparatus would be necessary to make this new unit feasible. A manpower and supply carrying van was the first vehicle purchased and was placed in service on March 1, 2004. The first incident that the new Rehab Unit was called to was the King of Pizza fire on March 15, 2004. 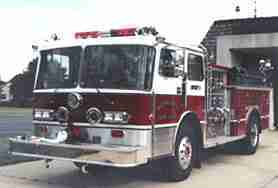 The second piece of apparatus was designed and ordered in June of 2003. 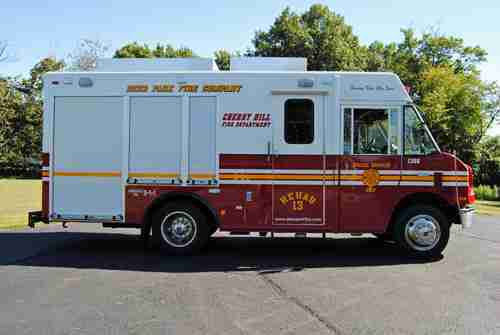 This unit to be known as Rehab 1385 was delivered on July 12, 2004. It was placed in service officially on August 1, 2004. The first incident that the new 1385 responded to as a mutual aid response was a 2 alarm house in Pennsauken Township, NJ Rehab 1385 is equipped with two refrigerators, coffee and hot water makers, a two burner stove, microwave oven, and a commercial hot dog grill, as well as drink dispensers to serve hot or cold food and drink at emergency scenes. This truck also carries Rehab equipment and can provide cooling and heating in a safe and quiet rest area for emergency workers at the scene of any type of emergency. This truck is also equipped with a full service restroom facility, the only one of its type in South Jersey. Delivered in early 2015 the new U1386 was built by Custom Mobile Food Carts of Hammonton, New Jersey. 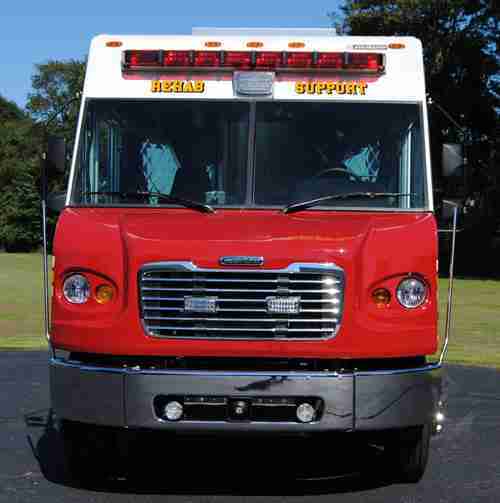 This is the same company that built our first out Unit 1385 or it is designated, “Rehab 13.” Both of these units were “first builds” for Custom – 1385 being the first fire department rehab and 1386 the first “rescue” style vehicle built by Custom Mobile Food carts in Hammonton. The old 1386 had limited space for carrying manpower and equipment to the scene. We needed to upgrade the older unit to a vehicle that would more closely meet our needs as Rehab 13 evolved. Now in our 13th year has served us very well. When Rehab 13 is toned out for an incident both units will respond as a two-piece company to provide adequate capacity for food preparation, extra supplies food and equipment. The following options/capacity were required and met: It is a Freightliner MT-55 chassis, with Cummins Diesel engine, Allison automatic transmission, air brakes, Onan diesel generator, roll up rescue style doors on the rescue body, 150’ electrical cord for tent and electrical power, and an expanded compartment storage capacity for the tent heater and air conditioners, cases of water and MVP, 4 shelf freezer for extra food and frozen electrolyte popsicles, 8 core cooler chairs with extra reservoir bags, spare one gallon jugs of room temperature water, rope, shovels and calcium chloride for winter use, (5) person heated and air conditioned interior crew/rehab area, tools, first aid equipment, personal FRS radios for scene communications of the non-emergency messages, a 4500 Watt Command light tower, LED scene lighting on all four sides of the vehicle. The trucks lighting except for the headlights are the latest in LED low current draw lighting. It also has two rear slide out shelves for the Zumro tent and all support equipment for the tent, including lighting and 25 folding chairs, tarps, tables, and a stake kit for ground and paved areas for windy days to secure the tent. All doors and exterior steps are illuminated by switch operated LED lighting for safer night operations. 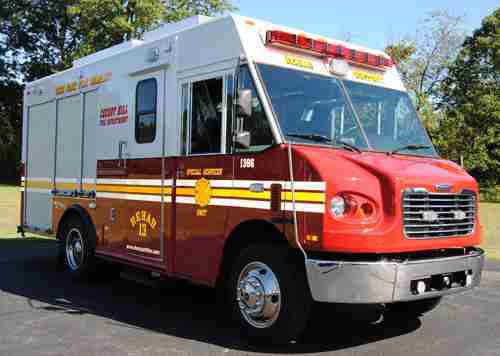 1386 is also equipped with the latest in 700 MHz radios both mobile and portable, and FPS units for finding the out of Camden County assignments. We also carry a Cherry Hill FD map book, Camden, Burlington, and Gloucester County map books, and a special map book of Gloucester Township map book of all multiple family buildings and complexes to make our responses a little easier. We look forward to many years of service from this new unit and must thank the Cherry Hill Fire Department’s motor maintenance shop for its staff of mechanics for their prompt and service and expertise for keeping all of our units and the entire Cherry Hill Fire and EMS units in tip top condition every year.